"A gorgeously written novel on love, loss, and family," raves Nicola Yoon, the bestselling author of Everything, Everything, about this novel from the author of the Sisterhood of the Traveling Pants series. 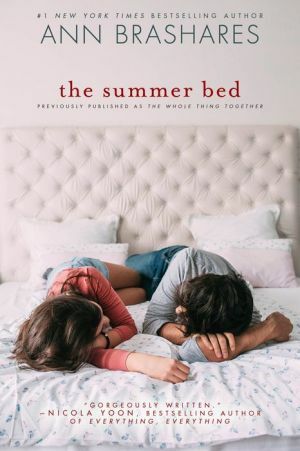 Two teenagers share the same room on alternating weeks at a shared summer house, imagining what it would be like to meet in real life. Previously published as The Whole Thing Together. For Sasha, summer means time at her family's sprawling old house out on Long Island. For Ray, it's the same. Sasha and Ray aren't related--and they've never met--but long ago, before they were born, Sasha's dad and Ray's mom were married. Then came a bitter divorce, remarriages, and a new generation of children. Now, the two families have an arrangement: use the summerhouse at your designated time and never cross paths. Sasha and Ray do connect, though, by email--joking around, confiding in one another, forming a friendship. They've shared so much already . . . what would happen if they met in real life?